When you’ve been hunting for a great gift, you may have heard about how drones are the latest craze. Amazon has been testing them for package delivery, and they’ve been all over the news. While it would be cool to spy on the neighbors, it may not actually be legal, but still a flying drone sounds like it’d make a fun gift. Toy drones are a subcategory of RC — Radio Controlled — gadgets. Many RC toys are flying drones or UAVs — Unmanned Aerial Vehicles. What makes a toy, rather than one meant for professional endeavors is usually due to its size. A toy drone may be more compact, or fit within the palm of a hand than a flying drone, though those can be considered toys as well. While these may be toys, they’re not necessarily for children. The complexity of learning to fly a quadcopter makes them more suitable to the older child, or adult. There are probably more adult quadcopter enthusiasts out there, than there are children. While toy drones may be marketed more towards children, they offer many exciting features to interest the adult as well. There are many manufacturers that make flying toy drones, including Cheerson, Syma, KiiToys, Hubsan, and Syma. In some cases it may be more difficult to learn to fly a toy, but many include beginner functions to help you out when learning. Have a look at these five toy drones, to see which ones will make the perfect gift for a friend or loved one. 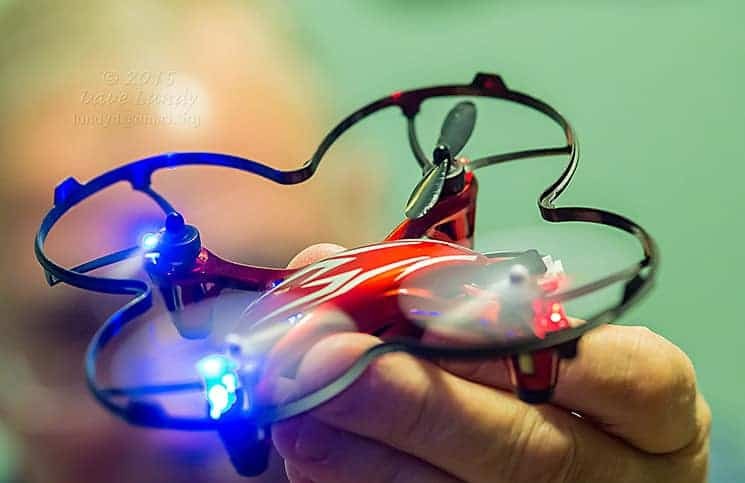 The Top 9 Best Toy Drones In The Market That Money can Buy! The Cheerson CX-10 mini quadcopter is smaller than your regular quadcopter. It may be a bit difficult to learn to fly, as it’s smaller, and has fewer auto controls, but once you get the hang out it, it’ll be fun. The Cheerson CX-10 mini quadcopter is one of the most affordable quads to buy, and a popular entry level choice for many. The body of the Cheerson has four LED lights so you can keep track of it in the air. This is also perfect if you decide to fly at night, as otherwise it would be impossible to keep track of it due to its smaller size. This also enables you to see which way your drone is facing. There is a full-size radio controller that comes with the drone, so it’s easy to control it from the ground. The controls are labelled, and easy to use. The joysticks grip easily. You can also choose from three different speed settings. You can use a USB cable to recharge your drone. One charge takes forty to fifty minutes, and will give you four to eight minutes of flying time. The drone is still extremely durable, despite its cheap price. you can put it through its paces, and even crash it, and it’ll bounce back. It’s made of touch ABS plastic. The Cheerson CX-10 mini quadcopter does come with eight extra propellers in the package, so you can replace them as needed. The Syma X1 quadcopter is a lightweight drone made by a trusted manufacturer. This drone is four channel, so that you can move the drone backwards and forwards, left and rightwards, turns, and from side to side. There are two different flying modes with this drone. Beginner will get you in the air, but most of the functions will be automatic, helping to prevent you from crashing. The more advanced mode will let you to fully take over control, once you’re confident about flying. When you accelerate with this drone, it will stay stable in the air, so you don’t have to worry about it crashing. For newcomers to the hobby, it’s best they start with the lower speed, and keep it closer to the ground. It may be harder to fly outdoors, and the wind conditions may be working against you. You may wish to select a nicer day to take the Syma X1 quadcopter outside. The radio control transmitter is easy to learn how to use. There are two joysticks which are large and easier to control. The controller has a LCD screen that displays which function you have chosen. The Syma is powered by a small removable and rechargeable battery. You can buy extra, so that you have more time flying. It charges up with a USB cable. The current battery life will display on the LCD screen so you can see how much longer you have to fly your drone, and be able to bring it back in time before it falls to the ground. It takes forty minutes to charge up the Syma X1 quadcopter, which gives you about five or six minutes of fun flying time. UDI U818A is one of the best models in the market. Its low price allows it to be in range of most people, and to be bought as toys for their children. The “6 AXIS GYRO with posture control” is an integrated system that allows precise and defined movement and positioning of the aircraft. A 4-Channel function provides stable flying along with a First-Person view video camera. Although, the U818A comes with a 1 gigabyte memory card and the video is not HD, but it can store hundreds of pictures at a fairly good quality. Upon opening the box, the drone is already assembled and ready to be used. All that needs to be done is charge the battery. Its 120 minute charging time that gives approximately 7-9 minutes of flight time overcomes most drones’ flight time. Even in gentle winds, roughly 10 mph or less, the UDI U818A flies strong and stable; due to its lightweight, winds any higher will blow it away. Its Modular Design makes installation and repairing extremely easy. The 30 meter remote distance is great for wildlife photography staying at a very safe distance. As it advances, it becomes better and better. Some buttons on the controller allow different styled flips and quick flips. KiiToys X-10 Mini Quadcopter may not be as popular a brand as some of the other makers, but it’s certainly worth checking out their KiiToys quadcopter. It’s priced at anywhere between $25 to $60. Their claim to fame is that they have the smallest drone in the world. It measures just 1.5 inches by 1.5 inches, or 4 centimeters by 4 centimeters. The KiiToys quadcopter is definitely a toy, and not something you’ll want to take out to your professional film shoot. Many people love the different color choices. You can choose from green, orange, red, pink, and green. This toy can be given to boys or girls, though you won’t want to feel limited by color choices. Kids will enjoy adding their other toys to their flying scenarios. This toy is so tiny, you can even pop it into your pocket. But you may wish to avoid damaging it, so purchase a separate pouch or bag to keep it in when not in use. The KiiToys quadcopter has functionality to fly it up, down, forwards and backwards, left and right, as well as drifting, and hovering. You may even be able to learn how to do some stunts! It has a flip function control. You can fly this drone indoors or outdoors. It comes with a separate game pad style radio controller. Its built with four channels and has a six axis stabilization system. The four channels will enable your entire family to fly four quads at once, without interference! The KiiToys quadcopter is built of a strong plastic material, so it can withstand the bumps and hits it’s going to get. It has a “throw to fly” feature, so you can simply toss it in the air and it will stabilize itself and take off. There are LED running lights so you can keep your orientation, as well as see it at a distance. You’ll need to charge up your drone with a USB cable. One charge will give you about five to eight minutes of drone flight time. It has a built-in 3.7V 100mAh lithium battery. You can buy replacement rotors, as these tiny ones tend to get damaged. 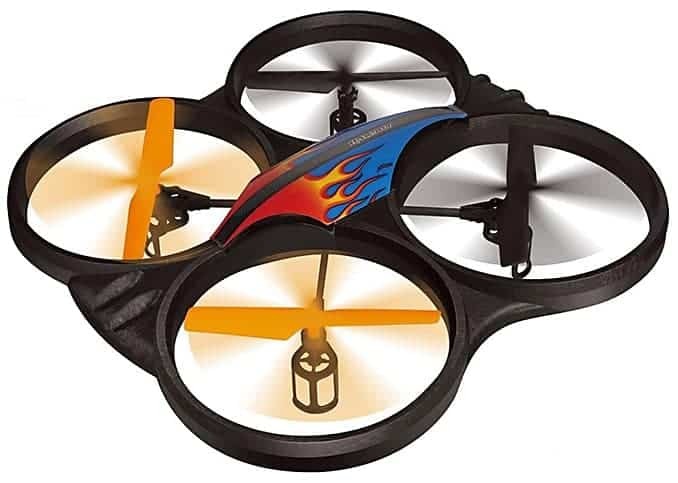 Haktoys HAK907 is another addition to the list of extraordinary drones for children with great reviews on several different sites. It does not come with a built in camera and is slightly more expensive than others, however due to the rest of the features that no else gives, it’s worth it. It provides one of the best battery timings out of many drones designed for children. 8-10 minutes of flight time can be achieved from charging it for only 90 minutes. It comes with an indoor and outdoor flight facility along with LED light and a 3 speed modes. This model also uses the 4-Channel and 6-axis gyro scope that is great and suited for auto-stabilization and due to this; stunts and aerial tricks become a lot easier. The 2.4 GHz frequency remote control offers better control and synchronous flights. It is capable of video recording but the camera kit is to be bought separately. All spare parts are easily available which is great for beginners. 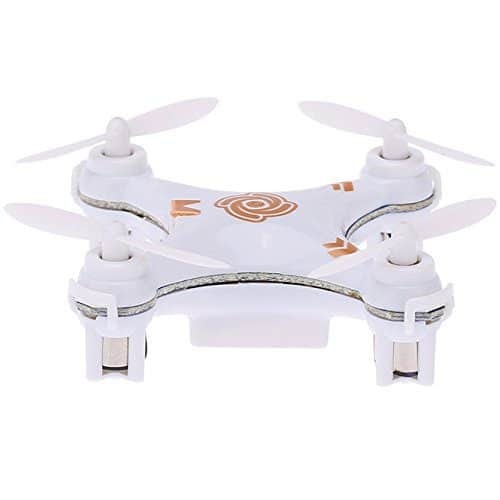 The Hubsan X4 H107C is a 2.4 GHz Quadcopter that comes with a built-in 0.3 megapixel camera with an included recording module that works with a SDHC card. This, like many others, uses the 6-axis flight control that guarantees stability, but only the X4 offers adjustable gyro sensitivity. The LED’s are clearly visible and it survives numerous crashes. The X4 is a light-frame drone that is the assurance of durability and resilience. It allows a 4-way flip (left, right, forward, backwards). The X4 H107C has a good amount of thrust and is fairly powerful. This drone has gotten several positive reviews from satisfied customers, with an overall rating of 4 stars. The camera is located in the center of the drone – and it features an average camera, with a moderately narrow view of about 55 degrees. This means that the recorded video will be of decent quality but not extraordinarily HD. 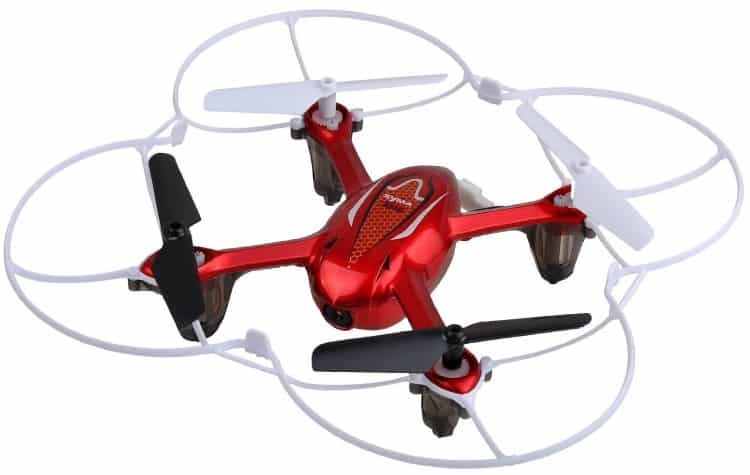 The Hubsan X4 H107L quadcopter is another small flying drone choice that is perfect for beginners. It’s another option that fits within the palm of your hand, and it’s affordably priced under $50. The Hubsan is made in a one piece frame, and it is lightweight. It’s still durable, and can withstand any rough bumps and crashes on the flying field. You have the choice of whether you wish to fly it indoors, or outdoors. It ranks high in ratings, and may be one of your best choices when you’re searching for the best toy drone under $50. The Hubsan X4 H107L quadcopter comes with four LED running night lights, so you can see it at a distance, particularly in the evening. Two lights are white, and two are blue. It has a black plastic casing, and two black, and two white blades. There are also other color choices available, at differing price points. One neat feature of this drone is that it is built to withstand windy conditions. Not all drones in this lower price class can make that claim. It has a precision six axis gyro, which helps to keep it in the air. This enables it to have adjustable gyro sensitivity. The Hubsan X4 H107L quadcopter has the power to drift in windy conditions, and also to acknowledge the controls that you send to it. The radio controller has four channels at 2.4 Ghz. The Hubsan X4 H107L quadcopter has powerful coreless motors. There is a stunt mode so you can perform tricks and maneuvers, without any effort. It weighs in at four ounces and the quadcopter measures in at 2.4 inches by 2.4 inches. The Hubsan X4 H107L quadcopter has the power to drift in windy conditions, and also to acknowledge the controls that you send to it. It take about thirty to forty minutes to charge up your Hubsan X4 H107L quadcopter and get it ready for the field. One charge will give you about seven to nine minutes of drone flight time. It’s built with a high capacity LiPo battery. The propellers may need to be replaced at some point, but this is a common problem for any drone, and replacements sets are available for order. The Hubsan X4 H107L quadcopter is ready to fly right from the box, and needs no pre-assembly. The Syma X11 is a drone packed with a futuristic look, which looks like right out of a Sci-Fi movie. It is one of the most economical drones available and is of great quality. It has great reviews with 56% being 5 stars and an overall of 4 stars. This has all the aspects of expensive Quadcopters and drones except the price itself. 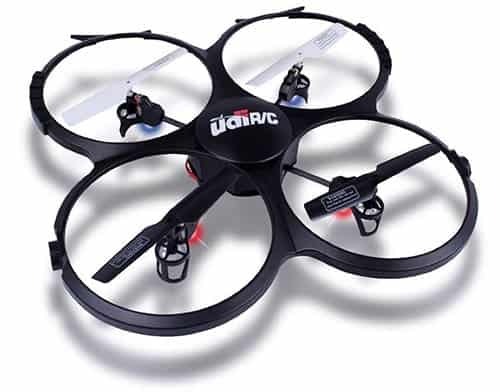 It has an indoor and outdoor flight function with a 4 Channel Remote Control. Like the rest, this also uses the 6-axis stabilization system that guarantees a smooth flight. However, the best feature of all is the included prop-guard and spare set of 4 propellers in case it needs repairing. This feature alone makes it ideal for the use of children. In addition to these entire features, the Syma X11 uses a 2.4 GHz Spread Spectrum Technology Remote Control that provides a wider bandwidth of about 30 meters (100 feet) and range than any other drone. 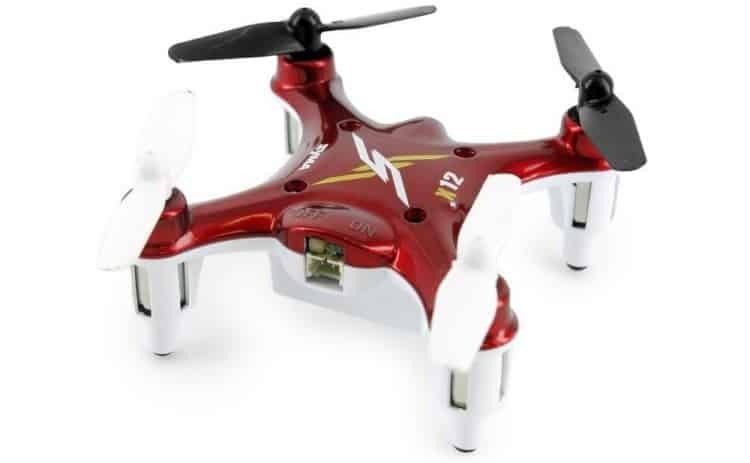 The Syma X12 quadcopter is also one of the smaller flying drones that you can buy today. 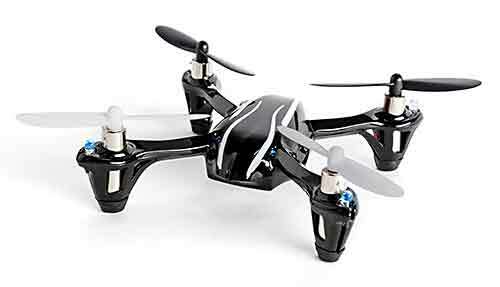 It has fun LED lights on front and back, and is great fun to fly in a darkened room at night. It’s usually priced at under $25. You’ll not only be able to fly it indoors, but outdoors as well. 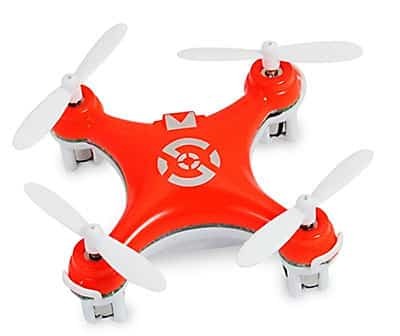 The best age for this toy drone is over fourteen years old, but you can supervise children who are younger to teach them how to fly it. It comes in a few different color choices, all priced differently. It’s lightweight, and weighs about 8.8 ounces. However, there’s nothing compact about the radio controller, as that is built to full size. While you can fly the Syma outdoors in moderately windy conditions, it won’t be able to tackle heavy winds. It promises to be easy to fly, and is fairly stable in the air, even if you’re clumsy at the controls. It’s perfect for beginners to learn on, then they can escalate up to the next level of flying drones. Like other good quadcopter brands, the Syma is built with a six axis system. This system also enables you to do stunts in the air. It will do 360 degree rolls and flips. 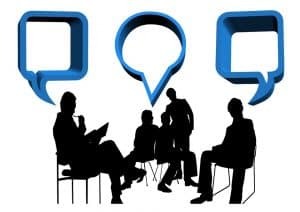 It is recommended that you make sure your battery is fully charged up first, otherwise it won’t roll, it’ll just waver in the air, leaving you wondering what has happened. The Syma X12 quadcopter does come with a regularly sized radio controller. This enables you to get a good grip at the joysticks and controls. It takes thirty to forty minutes to fully charge up your Syma X12 quadcopter. This will enable you to have a flying time of four to five minutes. This is pretty short, but you have to remember how tiny the battery is in this small quad. Whilst we aim to provide you the best priced products in the market in 2019, there are always special occasions like Black Friday & Cyber Monday where, all products are available at an extremely discounted price on Amazon through deals. Toy drones make the perfect gift for everyone. It’s a unique gift, and you’re guaranteed that your friend or loved one won’t already have one. If they do, they’ll you’ll have certainly heard about it long ago. There are many bragging rights for when you own a drone. Soon, your friends and family will be urging you to show them how one works. Most of the listed 5 best flying drones above cost under $50. 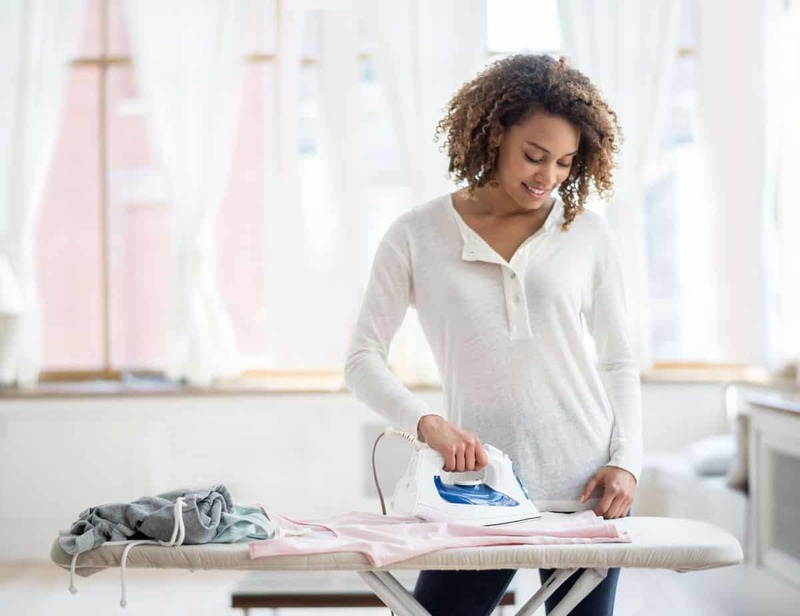 They are a great start to a fun hobby that will not only get you off the couch, but also give you some fresh air and exercise too.